Finding out you're going to be a dad is a life-changing mument, but along with the excitement, you may feel daunted. So how can you prepare yourself for the arrival of your newborn? During pregnancy, think about the health of your baby and be supportive of any lifestyle changes that mum needs to make. Attending antenatal classes with your partner will give you an idea of what is going to happen and how to cope with it all. Giving up smoking is very important, not least because of the passive smoking for the unborn baby. In some cases, it's much easier for the mother to give up smoking if she's not in a smoking environment. The same goes for alcohol and healthy eating. Sometimes men may not realize how exhausting it can be to be pregnant. Their once fun-loving bubbly partner who liked to go to clubs, go for long drives or just do the things you usually do together just won't feel like it. It's a question of not making them feel bad about this. When it comes to the birth itself, the old notions of dads pacing up and down outside the delivery room no longer apply. - 'I'll definitely be in the delivery room. - 'I don't think I'll be bothered because birth is such a natural process. Which category do you fall under? Most men like to be involved, but keep in mind it's not just mum who will find the birth difficult. Fathers often say that birth is the worst experience of their life and also the best. Most fathers say they wouldn't miss it for the world, but some do find it traumatic. For any man, the birth is an incredibly moving mument in their lives. It's a life-changing event, just as it is for women. But perhaps there's more of a dawning for a man than for the woman, who has carried the child for nine months already. After the birth you should try to pitch in as much and as quickly as possible. Your company has introduced paternity leave, which is recognition of the importance of fathers' involvement. The earlier fathers' get involved, the better. Both mothers and fathers are on a very steep learning curve after the birth, particularly with the first child. If the father is learning at the same time as the mother, he doesn't regard himself as the secondary parent, simply receiving information from her. Studies show that postnatal depression is lower in women when the father is involved, and breastfeeding is more successful when fathers are supportive. It can be a difficult time and a father who is there supporting a woman through any problems is going to be a great help. There is a lot to learn in those first few weeks: breastfeeding, washing, changing, comforting and simply learning the rhythms of a new baby. A father needs to be involved with all these, just like the mother. 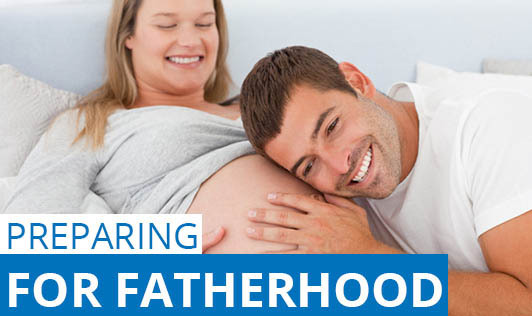 New fathers can find their role completely changes once baby arrives. They move from being in an interchangeable partnership to a position where they need to care for and support the mother so she can provide for the baby. It doesn't have to stay like this forever, if you don't want it to. But in the early weeks it can help fathers to see it like that, rather than as not being able to mother the baby and therefore having no role. Fathers have an important role, but it's just different to what they have experienced before. A major issue for new dads is having someone to talk to about what they're going through. Men who have been there before will tell it like it is and give you an idea of what to expect. Men primarily use their partners as mentors, particularly around issues of children and parenting. Because of this, you can become very isolated. Both of you may be stressed and tired, and your partner might not have time to offer support. However, you may not have many other people you can discuss these things with. If I need any advice or anyone to talk to, speak to your dad or male friends who were once new dads.